A baby's skin is 30% thinner than ours, so it's no surprise that its more vulnerable to damage and dryness. Their skin barrier is weaker, too, which makes baby's skin lose moisture up to five times faster. So if your baby has sensitive skin, at bathtime you would want to use the best baby bar, one that gently cares for their sensitive skin. That's where Baby Dove Sensitive Moisture Bar can help. It is formulated to offer more than just mild cleansing: more caring than any baby soap bar*, it gives your little one's skin the gentle cleansing care it needs, while helping to retain moisture and replenish essential nutrients lost during bathing. Ophthalmologist, dermatologist and pediatrician-tested, this Baby Dove baby bar is hypoallergenic, pH-neutral and unscented to minimize the chance of allergies, meaning it wont irritate their gentle skin. 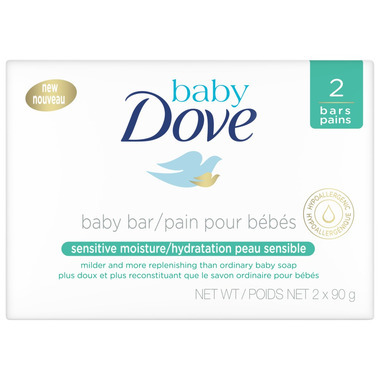 With the unique 1/4 moisturizing cream, Dove baby bar keeps your baby's skin feeling touchably soft and helps prevent the dryness that ordinary baby soap bars can cause. *Ordinary soap-based bars without skin-essential nutrients. INGREDIENTS: Sodium Lauroyl Isethionate, Stearic Acid, Lauric Acid, Sodium Tallowate, Aqua, Sodium Isethionate, Sodium Stearate, Cocamidopropyl Betaine, Sodium Cocoate, Dipropylene Glycol, Sodium Chloride, Tetrasodium Etidronate, Tetrasodium EDTA, Maltol, Titanium Dioxide.